University of Illinois kinesiology and community health professor Ruopeng An found that diet beverage drinkers compensate by eating a greater percentage of unhealthy foods that are high in fats, cholesterol and calories. CHAMPAIGN, Ill. — Want fries with that diet soda? You aren’t alone, and you may not be “saving” as many calories as you think by consuming diet drinks. A new study that examined the dietary habits of more than 22,000 U.S. adults found that diet-beverage consumers may compensate for the absence of calories in their drinks by noshing on extra food that is loaded with sugar, sodium, fat and cholesterol. University of Illinois kinesiology and community health professor Ruopeng An examined 10 years of data from the National Health and Nutrition Examination Survey, conducted by the National Center for Health Statistics, which asked participants to recall everything they ate or drank over the course of two nonconsecutive days. Alcoholic drinks and sugar-sweetened beverages are associated with higher overall daily intakes, although people who drink diet beverages consume a greater percentage of non-nutritious food. An compared participants’ daily calorie intakes, including their consumption of discretionary foods and five types of beverages – diet or sugar-free drinks; sugar-sweetened beverages, such as sodas and fruit drinks; coffee; tea; and alcohol. Using a U.S. Dept. of Agriculture food database, An compiled a 661-item list of discretionary foods, which includes foods that do not belong to the major food groups and are not required by the human body but may add variety to a person’s diet. These energy-dense, nutrient-poor foods include products such as cookies, ice cream, chocolate, fries and pastries. More than 90 percent of the people in the study consumed discretionary foods daily, averaging about 482 calories from these products each day, An found. Although previous research on beverage preferences and consumption of discretionary foods focused on between-meal snacking, An chose to look at the nutritional quality of the food participants consumed rather than when it was eaten. 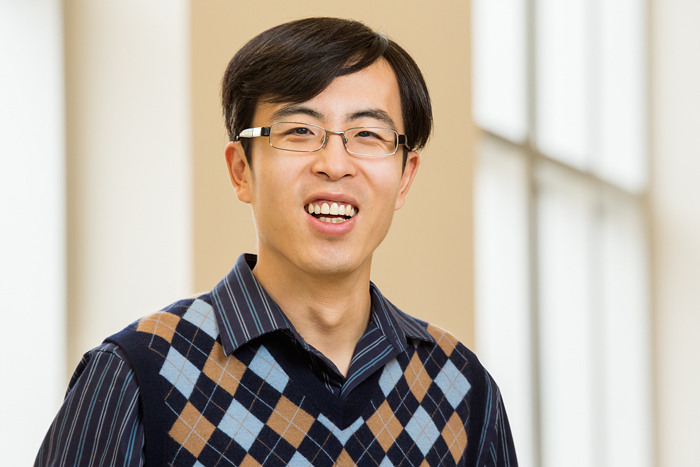 His paper will appear in a future issue of the Journal of the Academy of Nutrition and Dietetics. About 97 percent of the study population consumed at least one of the five types of beverages daily, with about 41 percent of respondents drinking beverages from at least two of the categories. More than 25 percent of the participants consumed three or more types of beverages daily. Coffee was participants’ beverage of choice, consumed by more than half – 53 percent – of the population, followed by sugar-sweetened beverages (43 percent), tea (26 percent), alcohol (22 percent) and diet beverages (21 percent). 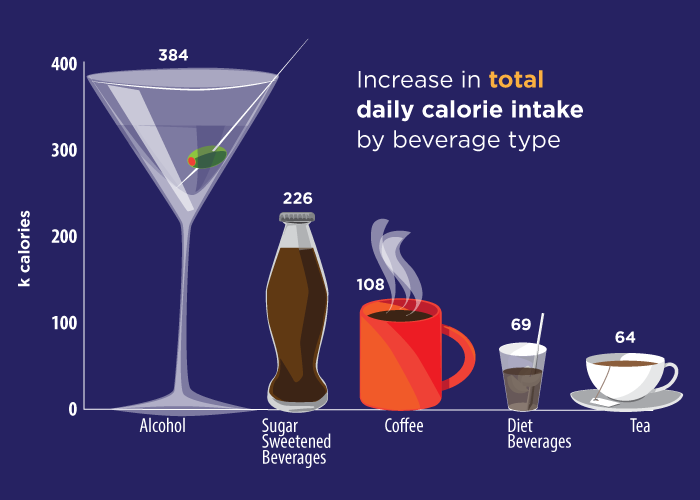 Alcohol consumption was associated with the largest increase in daily calorie intake (384 calories), followed by sugar-sweetened beverages (226 calories), coffee (108 calories), diet beverages (69 calories) and tea (64 calories). 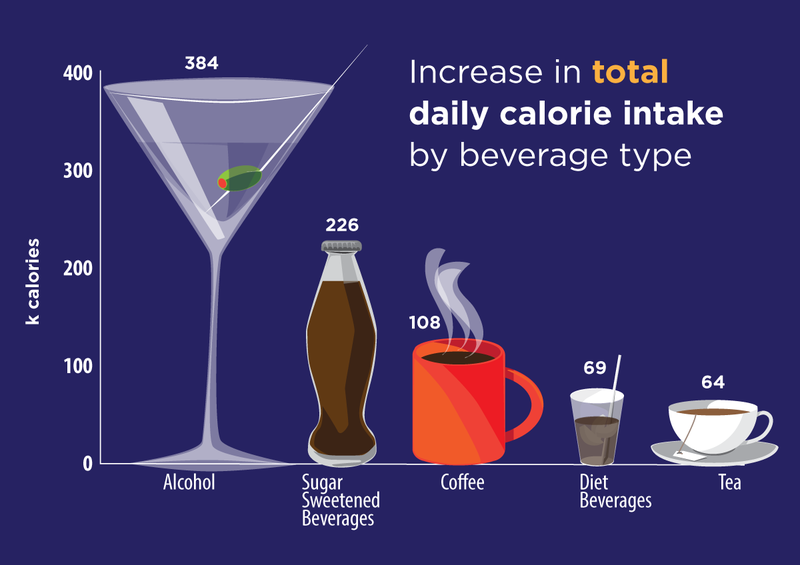 While coffee and diet-beverage drinkers consumed fewer total calories each day than people who preferred alcohol or sugary drinks, they obtained a greater percentage of their daily calorie intake from discretionary foods – a finding that suggests a possible compensation effect, An said. A third possible explanation might be that people opt to drink diet beverages because they feel guilty about indulging in unhealthy food, An said. Associations between beverage consumption and daily calorie intake differed substantially across population subgroups, An found. African-Americans who consumed diet beverages, sugary drinks and coffee, as well as Hispanics who drank alcohol, had the highest daily calorie intakes across all of the racial and ethnic groups. However, among people with the most education and highest incomes, diet beverages and alcohol were linked with increased calorie consumption, whereas, sugar-sweetened beverages and coffee were associated with elevated caloric intake among people with the lowest incomes. Obese adults who drank diet beverages consumed more calories in discretionary foods, as did normal-weight participants who drank sugar-sweetened beverages. In exploring associations between beverage type and dietary quality, An found that people who consumed sugar-sweetened beverages or coffee had the worst nutrition profiles. Switching to diet drinks may not help people control their weight if they don’t pay attention to the quantity and quality of the foods they consume, An said. An also recommended that public health interventions take a holistic approach, encouraging people to assess their beverage consumption in the context of their overall dietary behavior. The paper, “Beverage Consumption in Relation to Discretionary Food Intake and Diet Quality among U.S. Adults, 2003-2012,” is available online from the publisher and from the News Bureau.